We have listed some hotels below, please try to find an accommodation which fits your needs. Please be aware that BOOKING IS YOUR RESPONSIBILITY. We only provide the book sevice of Mercure Hotel and Parkyard Hotel Shanghai in advance before May 25th. If you need us to book the two hotels, please send the detail information (Name, Hotel Name, Room Category, Big Bed or Twin Room, Check in Date, Check out Date) to huangxiaoxia@sinap.ac.cn. Thank you in advance. The sessions will begin at 9:00, giving you enough time to have breakfast and take public transport to the venue. If you are like to book the Mercure Hotel by Local Organizing Committee, Please choose the button of 'Mercure Hotel' in accommodation section. 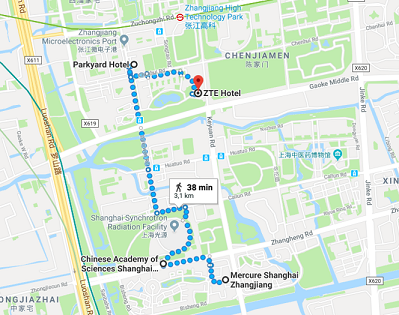 If you are like to book the Parkyard Hotel Shanghai by Local Organizing Committee, Please choose the button of 'Parkyard Hotel Shanghai' in accommodation section.